The FDA recently solicited comments (Docket FDA-2011-N-0898 on regulations.gov) related to it "... proposing to amend its regulations to implement certain drug shortages provisions of the Federal Food, Drug, and Cosmetic Act (the FD&C Act), as amended by the Food and Drug Administration Safety and Innovation Act (FDASIA). The proposed rule would require all applicants of covered approved drugs or biological products—including certain applicants of blood or blood components for transfusion and all manufacturers of covered drugs marketed without an approved application—to notify FDA electronically of a permanent discontinuance or an interruption in manufacturing of the product that is likely to lead to a meaningful disruption in supply (or a significant disruption in supply for blood or blood components) of the product in the United States." OK, so advance notification of upcoming disruptions or shortages to the FDA may give it time to look for solutions (asking other manufacturers to ramp up production, temporarily approving importation, etc.) but there need to be additional safeguards in place. 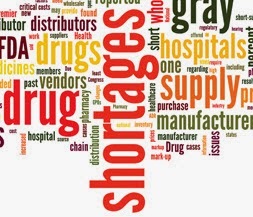 A hint of an upcoming critical drug shortage and the natural reaction of a hospital Pharmacy Department buyer will be to 'over-order' that drug to pad their inventory to protect his/her organization against a pending shortage. Enough of such transactions and the fear of a potential upcoming shortage will exacerbate the issue and immediately precipitate an actual drug shortage. The bottom line? The notifications will have to be well coordinated with the major drug wholesalers, so that exactly as the notification hits the FDA the wholesalers either restrict sales to their customers to some approximation of their normal purchase volumes, or some other system to prevent "safety" purchases and hoarding!